• Constant FS clamping force independent of the operation. • Possibility of actuating several devices at the same time. • Possibility of actuating various points; remote control performed also by machines. • Several versions are available with magnetic cylinders that enable positioning control without contacts, to obtain electric command impulses in certain clamping situations. The pneumatic series also contains vertical and push rod series with Fs clamping forces between 50 and 240 daN and Fh retaining forces from 70 to 450 daN for the light series; and Fs from 87 daN to 430 daN with Fh from 220 to 2000 daN for the heavy series. The use of a filter - reducer - lubricator group is essential for a long and smooth operation of the cylinder, while for a long duration of the mechanical components we recommend using suitable flow regulators and calibrating the speed of the motions desired, starting from a low speed and gradually increasing this speed. The cylinders of the heavy series (1000-2000/EPM/EPVM) already mount these flow regulators on the heads and they can be adjusted using a screw on the side of the air supply. Operating pressure between 2-6 bar. Ambient temperature -30° + 80°C. The Fs forces indicated in the catalogue were measured at a pressure of 4 bar. LIGHT SERIES: Components in case-hardening sheet steel. Hardened and tempered supporting pivots. Supporting bushes (for sizes from 200 daN and over) undergo case-hardening and grinding. HEAVY SERIES: Base made of black varnished spheroidal cast iron. Other parts made of galvanized (weldable) steel. Supporting pivots undergo case hardening. REINFORCED HEAVY SERIES: Base body made of black phosphated steel sheet; cemented and ground support pins and bushes. Double-acting cylinder with adjustable shock absorption. The tools of this series are built so as to be easily disassembled: the pivots are fixed axially with seeger rings. Material:Sheet metal and galvanized steel riveted pivots. Hardened and ground steel rotation pivots. Form AP3 with open clamping lever and two flanged washers. Form EP3 with full clamping lever and bolt retainers. Cylinder: Maximum operating pressure 6 bar. Maximum operating temperature 80°C. The proximity switches must be ordered separately. Features and applications:We recommend using a filter-reducer-lubricator group for a long and smooth operation of the cylinder, while for a long duration of the mechanical components we recommend using suitable flow regulators and calibrating the speed of the motions desired, starting from a low speed and gradually increasing this speed. A special grease is placed between two contacting surfaces during assembly. 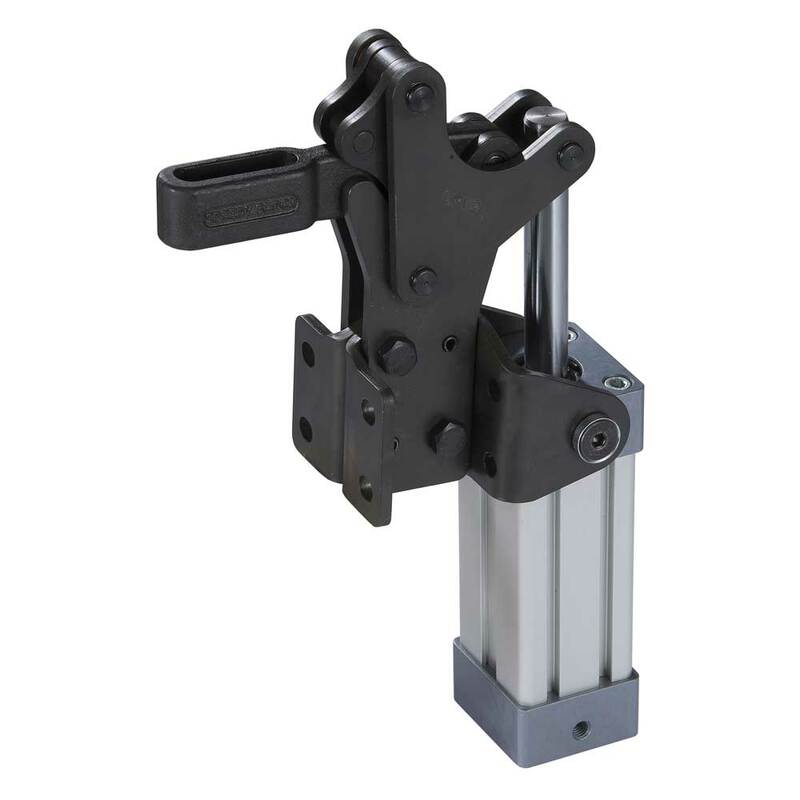 This manually actuated series is found on Vertical series with folded base. 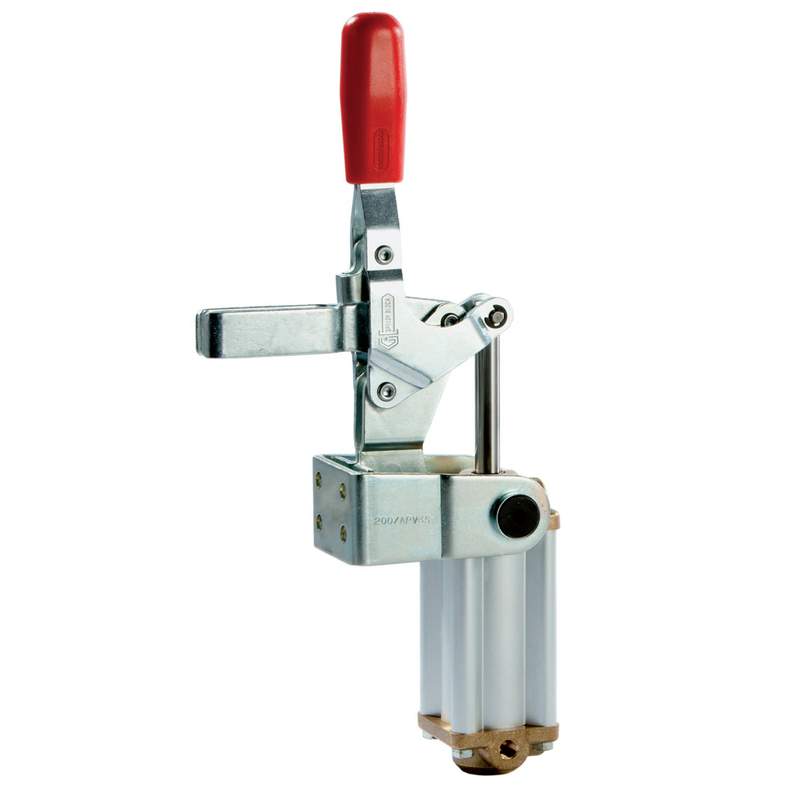 Form APV3 with open clamping lever and two flanged washers. 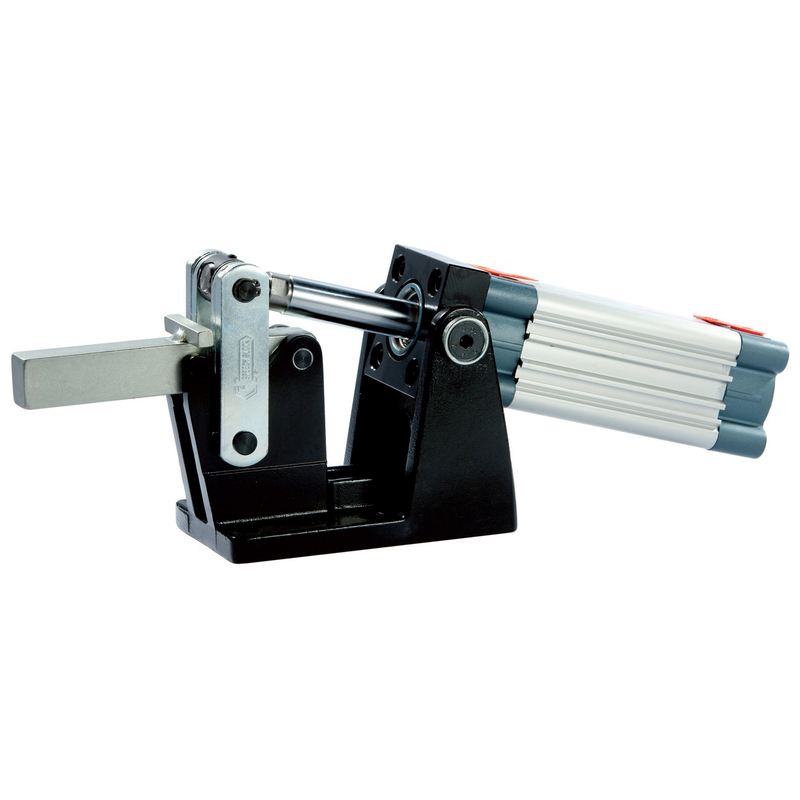 Form EPV3 with full clamping lever and bolt retainers. 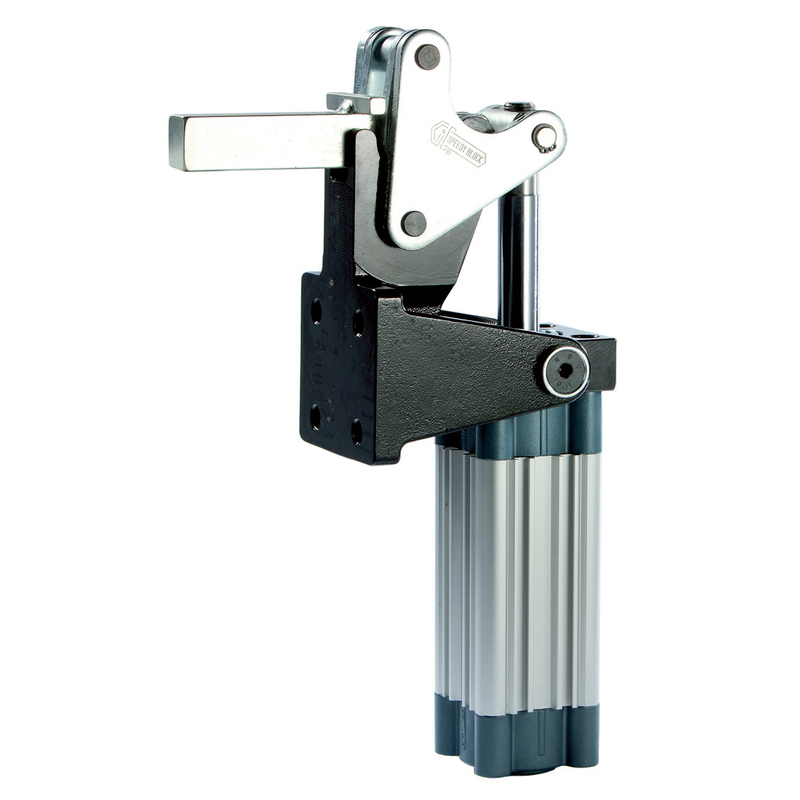 This manually actuated series is found on Vertical series with folded and front base. Form APV3S with open clamping lever and two flanged washers. Form EPV3S with full clamping lever and bolt retainers. 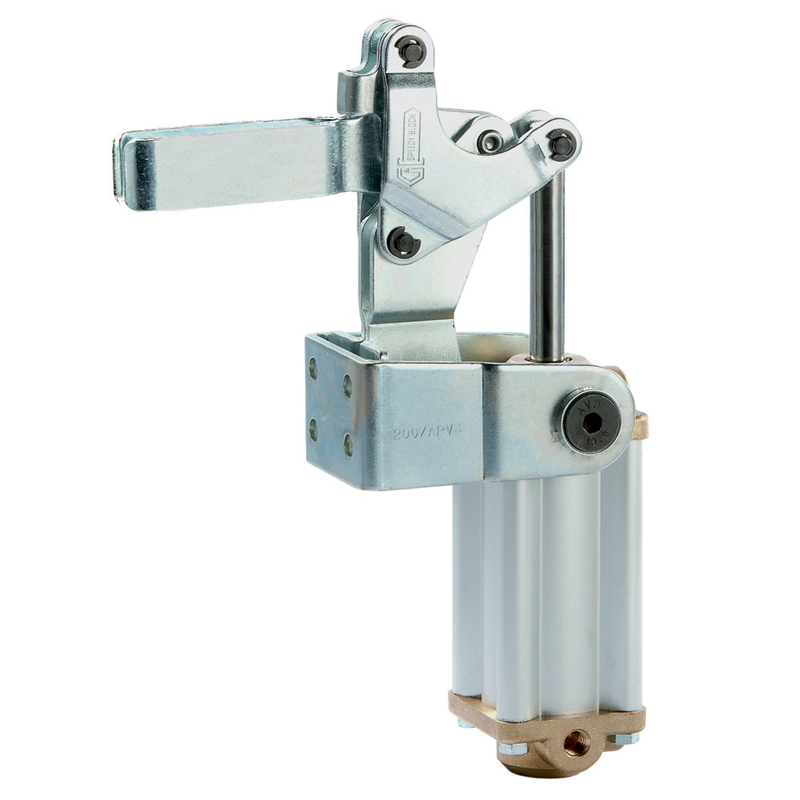 This manually actuated series is found on Vertical series with straight and front base. Material: Base made of spheroidal cast iron; Lever in galvanized steel; Hardened and ground pivots. Model AU470 is the reed switch for detecting the position (See Accessories Series) to be ordered separately. speed of the motions desired, starting from a low speed and gradually increasing this speed. Pivots: Hardened and ground Steel. Supporting bushes: Hardened and ground Steel. Features and applications:the clamping levers are obtained by hot moulding; the series is generally used in clamping jobs with medium and heavy loads, on welding masks, carpentry works, moulds and where large clamping forces and strong repetitiveness of movements are required. Basic clamp body:Black varnished brass for size 70; hot forged steel and painted black for the other sizes. 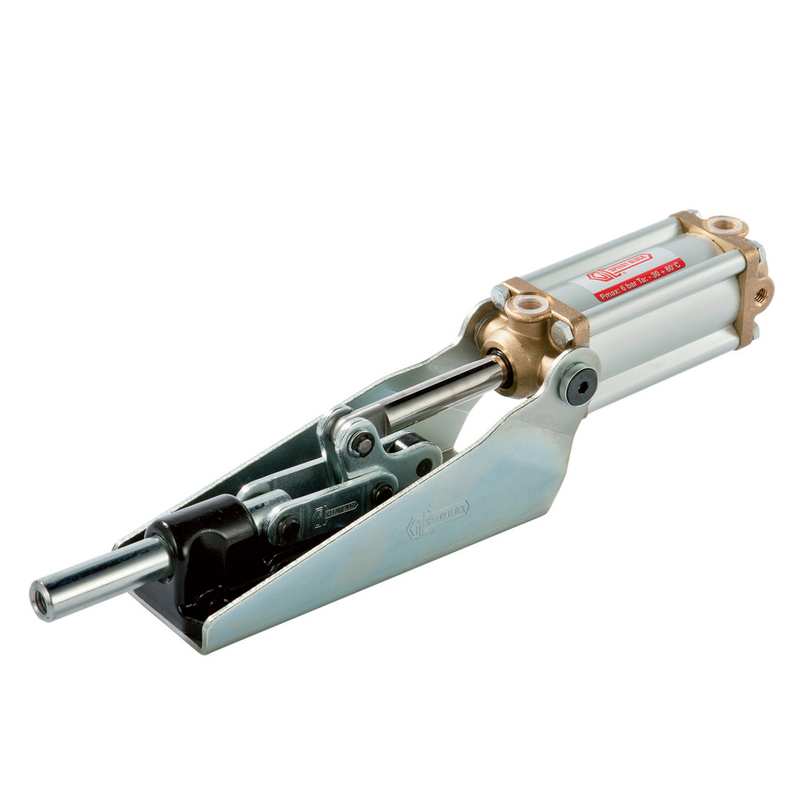 Performance:Form SP3 Tool equipped with normal pneumatic cylinder. Form SPM Tool equipped with magnetic pneumatic cylinder. 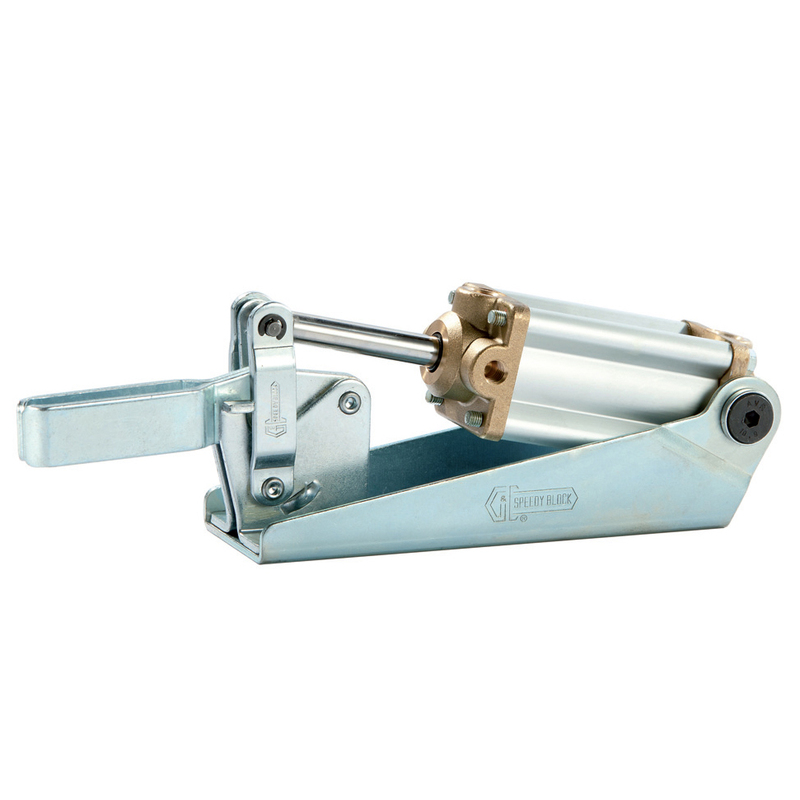 This manually actuated series is found on Push and pull straight-line action series.